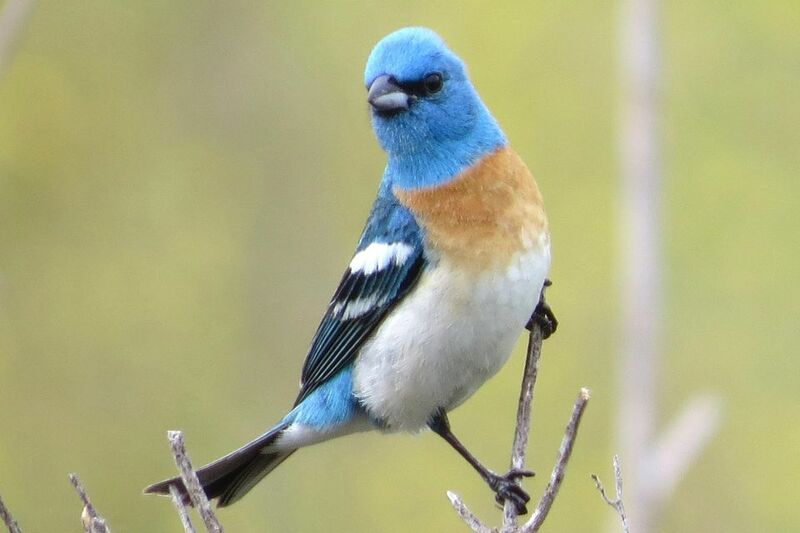 Beautifully colored and with a sweet warbling song, the lazuli bunting is a highly anticipated summer guest in western North America, and its early migration often makes it the first sign of a welcome spring. With its bright plumage, this bird can be easy to identify and is a fantastic addition to any birder's life list. At first glance, these buntings may be mistaken for bluebirds, but they're actually quite different. Recognizing key field marks and distinguishing features can help birders be confident when identifying lazuli buntings. Markings: Males have a bright turquoise blue head, throat and upperparts, though the back may show a brown wash, particularly in winter. The lores are black and give a mask-like effect to the face. The dark wings have blue edging and two broad white wing bars, and the tail is black with thin blue edging. The breast is a rich rufous, and the lower chest, abdomen and undertail coverts are white, though the flanks may show a buff wash. Females are a warm gray-brown or rich tan on the head, back and breast, with white to buff underparts. The wings and tail are gray with blue edging, and the uppertail coverts and rump are blue-gray. The wings show two buff wing bars, but the bars are not as broad as on males. Juveniles are similar to females but young males will show more blue mottling. Lazuli buntings are granivorous and eat a variety of different seeds and grain. Their diet can also include insects for extra protein during the breeding season, as well as fruits in the late summer and fall. These birds use their strong bills to crack seed hulls and will spit the hulls out, often wiping their bills on branches or perches to clean off debris. They stay low in foliage or shrubs while foraging and frequently forage on the ground. These songbirds prefer relatively open habitats with sufficient shrubby cover, including open woodlands, riparian areas, scrubby canyons and post-wildfire zones. Their summer range extends across North America from southern British Columbia, Alberta and Saskatchewan to the western parts of North Dakota and South Dakota, west to central and coastal California and south to northern Arizona and northwestern New Mexico. Lazuli buntings are early migrants and may begin forming traveling flocks in July before they head south. Their winter range is much smaller, confined primarily to western and central Mexico. Vagrant sightings are regularly reported much further east of this bird's expected range, particularly during fall migration, and they can be reported much further north as well. These passerines have a sweet warbling song with a high pitch and a fast pace that includes 10-15 syllables. The pitch and pace of the song changes throughout to give it an undulating cadence. The typical call is a single short, sharp "wheet" note, though it can be repeated at slow intervals. Male lazuli buntings sing to claim territory each spring, and these birds are relatively solitary or found only in pairs during the breeding season. Outside the breeding season, however, they can be gregarious and readily form flocks with similar species, including sparrows, buntings and finches. Their flight has an undulating pattern interspersed with short glides where the wings are held close to the body. Lazuli bunting males court females by fluttering their wings, throwing out their chests and otherwise trying to show off their plumage. After mating, the female builds a cup-shaped nest of grasses, weeds and spider silk lined with finer materials or fur and positioned 2-10 feet above the ground, usually in the crook of a tree branch. The oval-shaped eggs are a plain pale blue-white or green-blue color, and 1-6 eggs may be laid per brood. One pair of birds may raise 2-3 broods per year. The female incubates the eggs for 11-12 days, and after hatching, both parents feed the chicks for an additional 10-13 days until they are ready to leave the nest. Where ranges of the two closely related species overlap, lazuli buntings will hybridize with indigo buntings. These birds readily come to backyard feeders that offer birdseed, especially white proso millet or sunflower seed chips. Ground feeding stations, large hopper feeders or low platform feeders will be the most attractive, particularly for migrating flocks, and lazuli buntings visit bird baths as well. These buntings are widespread and relatively common in their range, despite the loss of habitat through development. They are also occasional hosts to brown-headed cowbird eggs, but that brood parasitism does not significantly affect their reproductive success. Overall, the lazuli bunting's range is slowly expanding and these birds are not considered threatened or endangered.